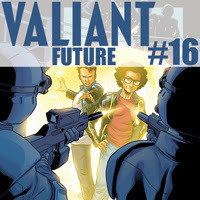 In this episode of Valiant Future, Adam, Joe, and Paul discuss a lot of big news in the Valiant Buzz. Plus, they discuss the latest releases from Valiant Entertainment. Valiant Future - X-O Manowar #21, Shadowman #15, Archer and Armstrong: Archer #0, Eternal Warrior #5, Eternal Warrior #6, and Harbinger #21.